Of the more than 154,000 ticket requests that flooded the office of Harpo Studios, just a few thousand of Oprah's most loyal and lucky fans were selected for Tuesday's back-to-back shows at the United Center. There weren't any free cars or any of Oprah's favorite material things, but there were plenty of her favorite people. The dual shows were a veritable who's who of pop culture the likes of which Chicago hasn't seen in a very long time. Appearing on stage throughout the night with the Queen of Talk: Tom Hanks, Tom Cruise, Josh Groban, Patti LaBelle, Beyonce, Halle Berry, Queen Latifah, Katie Holmes and Rascal Flatts. And that was just the first show. Part two brought Will Smith & Jada Pinkett Smith, Jamie Foxx, Stevie Wonder, Jerry Seinfeld, Simon Cowell, Rosie O'Donnell, Dr. Mehmet Oz, Dr Phil McGraw, Nate Berkus, Gayle King, Maya Angelou, Tyler Perry, Alicia Keys, Aretha Franklin, Usher and Maria Shriver. In the audience: former Mayor Richard Daley and his wife, Maggie Daley, Jessica Seinfeld, Charles Barkley, Dave Chappelle, Emmitt Smith, Wanda Sykes, and Robin McGraw, the wife of Dr. Phil. The father and brother of Bulls power forward Carlos Boozer were also spotted in the audience, as was Blackhawks captain Jonathan Toews, who brought his mom. Boxes of Kleenex were under most of the chairs on the main floor, a clear sign that there might be tears. And there were. One audience member named Alex from Winnipeg, Manitoba was called to the stage. From there, he called his gifriend on stage and proposed to her. She said yes and the crowd roared. Oprah, too, turned on the water works. An especially moving moment was when she was joined on stage by the young men of Morehouse College. One man, who just earned his PHD, later told NBC Chicago that his life would not be the same had it not been for Oprah's help with a scholarship a few years ago. The show -- dubbed as a "surprise spectacular" -- stayed true to its billing. Oprah, we're told, didn't know what the show would entail or who was on the guest list. Her producers only told her where and when the shows would be recorded. Throughout the night, Oprah was "surrounded by love," as Tom Hanks said. ABC News anchor Diane Sawyer would later reveal that 25,000 trees would be planted in Oprah's name. Singer John Legend announced that Target was going to rebuild several libraries across the country because of Oprah's committment to books and reading. Besides a star-studded night of entertainers and high energy, audience members did walk away with something from the show: a free copy of O Magazine. The shows will air May 23 and May 24. Winfrey's last show airs May 25 after 25 years. 11:22 p.m. -- Kristin Chenoweth, who performed "For Good" earlier in the evening, tweets: "Best night of my life. Sang for Oprah!!!" 11:15 p.m. -- Confetti falls. Celebrities gather. Hugs abound.The End. 11:10 p.m. -- Usher takes the stage, performs "Oh My God" with a choir. 10:55 p.m. -- Aretha Franklin is there, dressed in all white. She sings Amazing Grace. 10:50 p.m. -- The man in Oprah's life, Stedman Graham, is on stage. "I get to be around a woman who changes people's lives every day and also takes her own lunch to work." 10:35 p.m. -- Maya Angelous is there, reading a poem for Oprah. Alicia Keys is playing the piano. 10:24 p.m. -- Kristin Chenoweth sing's "For Good" from the musical "Wicked." 10:20 p.m. -- Shriver introduces Tyler Perry. Perry does his best to re-energize the crowd. 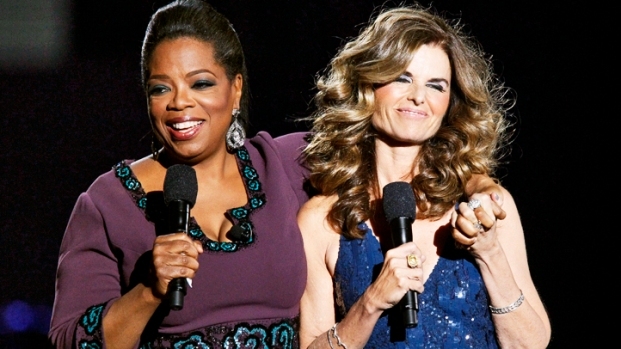 10:10 p.m. -- Oprah's BFFs Gayle King and Maria Shriver walk out on stage. King's mic doesn't work correctly. Shriver lauds Oprah and doesn't say a word about her own personal struggles. 10:02 p.m. -- Rosie O'Donnell walks on stage. She sings "You give me fever." O'Donnell will be using Oprah's vacated studio for her upcoming talk show. 10 p.m. -- Simon Cowell pays tribute to Oprah. He says that Oprah has done what no other TV personality has done with a show. And, he says, she's a good kisser! 9:46 p.m. -- Jerry Seinfeld is on stage with Oprah.He's making jokes about marriage and says Oprah's show is great for husbands-in-training. 9:37 p.m. -- Stevie Wonder appears. Now he and Foxx are both singing to Oprah. 9:35 p.m. -- Will Smith is going through the audience trying to find men who love Oprah. Jamie Foxx is one of them. Foxx sings the Stevie Wonder song, "Isn't She Lovely" to Oprah. 9:34 p.m. -- Jordan tells Oprah that if she ever needs a job she should call him. 9:32 p.m. -- Michael Jordan runs out and surprises Oprah. The crowd goes wild. 9:30 p.m. -- Show opens up with Will and Jada Pinkett Smith. Jada calls Oprah a "goddess." 9:28 p.m. -- The second show of Oprah's Surprise Spectacular is just about to get started. On Twitter, @RyanSchram shared this photo of the United Center and Oprah's stage. 9:02 p.m. -- First of two shows comes to a close.Oprah says she feels the love. 8:36 p.m. -- Another photo of Beyonce and her dancers, this time from @Sean_Iz_Legend on Twitter. 8:30 p.m. -- Target will rebuild a school library in Chicago in Oprah's honor, singer John Legend announces. 8:25 p.m. -- Oprah is being credited with selling 30 million books. Singer John Legend is seen from New Orleans, showing off books which were donated in Oprah's honor. 8:20 p.m. -- Access Hollywood's Shaun Robinson sent a photo out on Twitter of her in front of Oprah's stage. 8:10 p.m. -- Beyonce apparently not happy with her performance. The audience is going to see her perform "Girls (Who Rule the World)" a second time. She's coming back out and redoing the whole thing. 8:08 p.m. -- Photo of Beyonce performing from @stanimal13 on Twitter. 8:01 p.m -- Another photo from inside the United Center from @stanimal13 on Twitter. 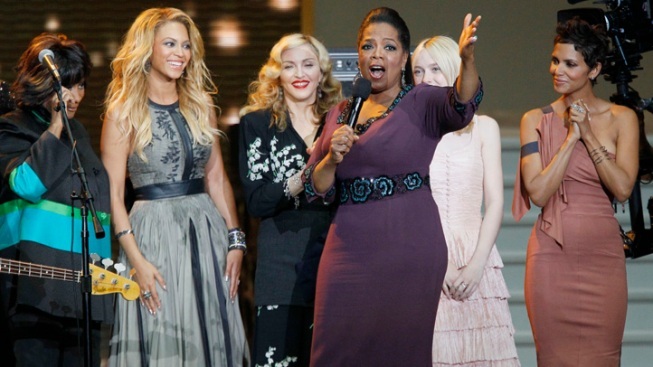 8:00 p.m. -- Chicago Tribune photo: Madonna on stage with Oprah. 7:55 p.m. -- Beyonce (another one-name lady) has taken the stage and is performing for Oprah and the audience. 7:53 p.m. -- Actress Dakota Fanning is on stage with kids of all ages. The "Oprah Show Babie" thank Oprah for helping them with their self-esteem. 7:50 p.m. -- NBC actors Tina Fey and Steve Carell appear in a special video salute to Oprah. There's also a video tribute from female soldiers in Iraq. 7:32 p.m. -- Patti LaBelle joins in, bringing the audience to their feet. 7:30 p.m. -- Josh Groban is there. He's singing "Somewhere Over the Rainbow." Patti LaBelle and Josh Groban sing "Somewhere Over the Rainbow." 7:28 p.m. -- Tom Cruise is on stage. "I love seeing Oprah's face!" he said as he surprised her. 7:25 p.m. -- Oprah says she's surrounded by love and thanks Chicago for 25 years. 7:20 p.m. -- Oprah, wearing a purple gown, is on stage with Tom Hanks to the music of The Black Eyed Peas. 7:17 p.m. -- The show begins! 7:12 p.m. -- The first show didn't start at 7 p.m., but that doesn't seem to have dampered any moods. The energy in the United Center is incredible. 7:04 p.m. -- Mayor Daley is all laughs and smiles. He's sitting with Maggie near the front of the stage, joking with Benny the Bull. Benny sat and hugged Maggie. 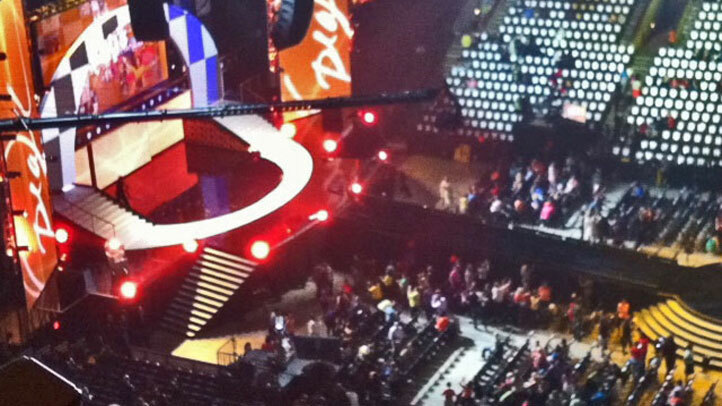 7: 00 p.m. -- More photos of Oprah's stage in the United Center from @iamBenLyons on Twitter and from the Chicago Tribune. Oprah's use of the United Center moved the NBA Playoff game between the Chicago Bulls and the Miami Heat, but the players agreed: Oprah can do whatever she wants.